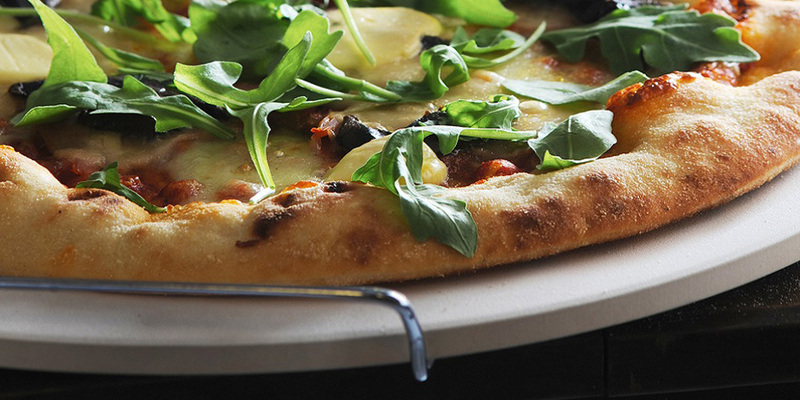 Using a pizza stone will ensure that your pizza base is crispy and cooked evenly. You can also use it for baking bread, cookies, biscuits, tortillas, pretzels, bagels and rolls. It is great for heating and re-heating ready made or frozen pizzas and baked goods. One important thing to remember when cooking with a pizza stone is to never place a cold pizza stone into a hot oven as this may cause it to crack. 1. Sprinkle the pizza stone with cornmeal and place in a cold oven. Heat the oven to 446°F. 3. Once the pizza stone has heated up, open the oven and slide the pizza onto the stone. Cook for 10-12 minutes or until it is crisp and golden around the edges. 4. Remove pizza from the oven using a spatula or something similar and transfer to a serving plate. Leave the pizza stone in the oven to cool. If you are serving your pizza on the stone, use an oven glove to remove them both from the oven and place the stone in the serving rack to bring to the table. Allow the stone to completely cool before cleaning. Once cool wash in warm water. We do not recommend using soap or detergent to wash your stone as this may leave an aftertaste. To remove any baked on remnants we recommend using a spatula. Allow stone to air dry before storing. Use an oven glove when handling a hot stone, even when it is in the serving rack. The stone will gradually darken over time and may stain with use; this is part of the stones natural seasoning and will not harm or affect the taste of the food. The stone is oven, microwave and freezer safe. To prevent the stone from cracking, avoid exposure to extreme temperature changes such as from oven to freezer or from freezer to oven.